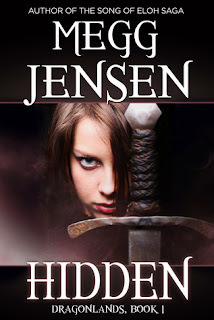 Karly Kirkpatrick: Megg Jensen's Hidden...Enter and WIN! Megg Jensen's Hidden...Enter and WIN! In honor of the upcoming release of Megg Jensen's new fantasy novel, Hidden, join in the party! Enter the contest and you can win an ARC (Advanced Reader Copy) of Hidden to read before it's released into the wild, as well as some swag! The mystery enshrouding Hutton’s Bridge is as impenetrable as the fog that descended at its borders eighty years ago. Each year, three villagers enter the mist searching for answers. No one ever returns. Then a dragon falls from the sky to the town square, dead—the first glimpse of an outside world that has become nothing more than a fairy tale to Hutton’s Bridge. Except to Tressa. Tressa grew up with Granna’s stories of the days before the fog fell. When Granna dies, leaving Tressa without any family, Tressa ventures into the fog herself, vowing to unravel the foul magic holding Hutton’s Bridge captive. What she discovers beyond the fog endangers the lives of everyone she loves. AUTHOR BIO: I've been a freelance parenting journalist since 2003 and began writing YA novels in 2009. I live in the Chicago suburbs with my husband, two kids, and our miniature schnauzers, Ace & Tanu. Enter Contest: Open to all US and International Readers!